Darth Vader wants Luke Skywalker -- alive. Prince Xizor, the largest trader in the galaxy, wants Skywalker dead. And Skywalker, along with Leia, Chewbacca, and the droids, have a goal of their own: rescue Han Solo. But Solo has been encased in carbonite and taken by the most notorious mercenary in the galaxy, Boba Fett, who intends to deliver him to Jabba the Hutt. It's a clash of good against evil, of right against wrong, and it comes to a head in the Shadows of the Empire . . . Featuring all your favorite characters from the Star Wars motion picture trilogy and a score of new ones, Shadows of the Empire is everything a Star Wars fan could hope for. 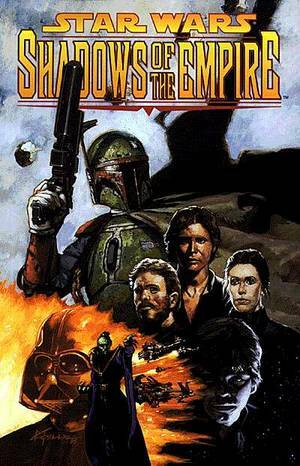 Star Wars: Shadows of the Empire TPB is not currently available from Things From Another World.If you're interested in locating this product, please consider contacting a registered comic shop or retailer near you. Entire contents trademarked (® or TM) and copyrighted (©) 1986-2013 by Dark Horse Comics Inc. and its respective Licensors. Dark Horse, Dark Horse Comics, and the Dark Horse logo are trademarks of Dark Horse Comics, Inc., registered in various categories and countires.